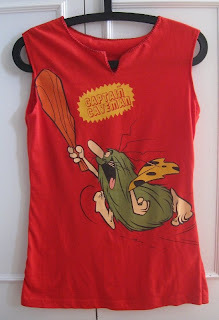 Jess gets crafty: Captain caveman! When we were kids we all loved watching this rather daft American cartoon - think Scooby Doo but with a caveman. For some reason one of my nicknames became 'Captain caveman', possibly this had something to do with my never brushing my long hair, so my sister Liz was very pleased with herself when she found me this t-shirt for my Birthday. 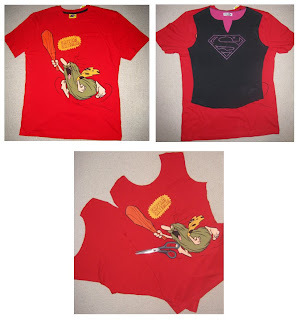 Unfortunately it was a men's medium which meant it was far too large for me, but as I really wanted to be able to wear it I decided to try a little t-shirt reconstruction. To help me get the courage to cut the top up I had a lovely glass of Baileys (all it takes is one drink for me to get a little giggly now) and then got stuck in. I pulled out one of my many tank tops to give me a guide to cut and drew around it remembering to leave 1/2 an inch for seam allowance. Once I had my two pieces cut I then spent some time hand sewing round the neck and the sleeves before getting out the sewing machine to do the easy straight seams. I even remembered to do an over locking stitch on those seams to give them a little more strength. After the t-shirt was assembled I added some blanket stitch around the neck to reinforce my seams up there as well as give the top an extra finishing touch. this post made me smile and took me back in time. btw thank you for your very nice comment on the crochet blog ! Well done! This looks great! I wonder how many gardens rang with the familiar 'CC' call - this so reminded me of my middle sister!